Leader of Liberation Tigers, V.Pirapaharan, received the first Compact Disc "Empowering our struggle" containing songs composed and sung by members of the LTTE medical corps, in a ceremony held in Kilinochchi Monday, sources from Vanni said. The audio CD encapsulated the inner feelings, thoughts and experiences of the members of the LTTE medical unit while serving in the battle field, organizers of the event said. Music was composed by LTTE cadre, Seyalveeran. 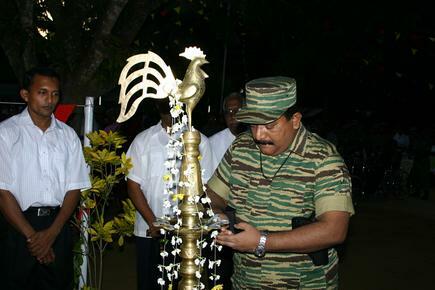 Member of LTTE's Nitharsanam (TV) division Veera presided the event. 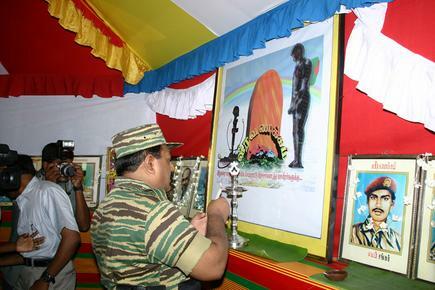 Mr.Pirapaharan, during the opening ceremony, lit the lamp of sacrifice and paid floral tribute to a framed drawing that represented the many members of the LTTE medical corps who laid their lives while serving in the battlefield. Pon.Thiyagam, Director of LTTE Heroes Cemetary, then lit the common flame illuminating the picture frame of late Captain Yarlvel and garlanded the picture. Cultural events followed beginning with a dance by women cadres of medical corps paying tribute to the war heroes. Dr.Ajanthan spoke about the achievements of the LTTE medical unit and released the CD. Following this, Mr.Pirapaharan felicitated the artists who participated in the production of the CD. Senior LTTE member V.Balakumaran and Director of Yarlvel Hospital Mr.Siva spoke at the conclusion of the event. Several LTTE cadres, Commanders, doctors and other officials participated in the ceremony, sources said.